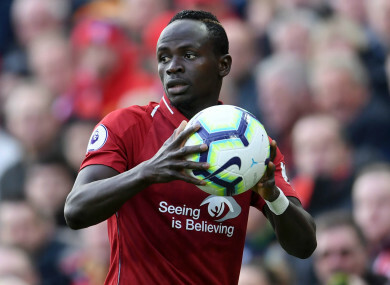 LIVERPOOL FORWARD SADIO Mane has undergone a “successful” operation on the hand injury he sustained on Senegal duty, the Premier League club announced on Wednesday. Mane reportedly broke his thumb in training prior to his country’s Africa Cup of Nations qualifier against Sudan on Tuesday. The 26-year-old returned to Merseyside for surgery, putting him in doubt for this weekend’s Premier League trip to Huddersfield Town. Jurgen Klopp will hope to have the attacker available after a costly international break that also saw Mohamed Salah and Naby Keita pick up suspected thigh problems. “The surgery, conducted at a north-west hospital and supervised by club medics, was successful,” read a Liverpool statement. Virgil van Dijk is also on Liverpool’s lengthy list of injury issues, although Netherlands boss Ronald Koeman is confident the centre-back’s rib complaint will not force him to sit out any club games. Email “Mane a possible doubt for the weekend as Liverpool star undergoes 'successful' hand surgery”. Feedback on “Mane a possible doubt for the weekend as Liverpool star undergoes 'successful' hand surgery”.